Boris Johnson has set out his own plan for Brexit, arguing that the UK should “chuck Chequers” and negotiate a “Super Canada” free trade deal instead. He said his vision would not lead to a hard Irish border, with any checks carried out away from the crossing. The PM says her plan is the only one which will avoid carving up the UK. And ex-attorney general Dominic Grieve, who backs a new referendum on Brexit, told the Evening Standard up to 40 Tory MPs were prepared to vote against any Canada-style deal if Mrs May ultimately opted for it. 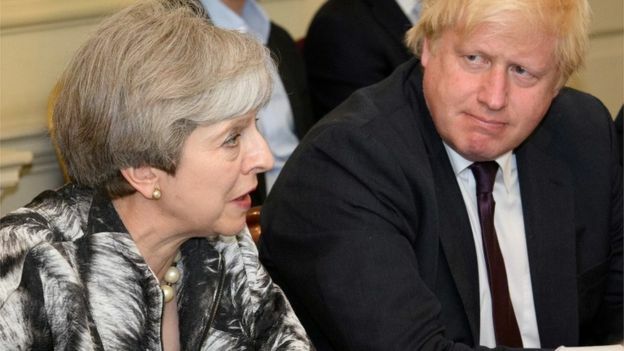 BBC deputy political editor John Pienaar said Mr Johnson’s 5,000 word article, published two days before the start of the Conservative Party conference, was a reminder that the PM’s plan had very little support in the party and it was going to be a difficult week for her in Birmingham. The UK is due to leave the EU on 29 March 2019. The two sides are seeking to negotiate the terms of exit, as well as an outline agreement on future co-operation. Parliament is to vote on any withdrawal deal. In an article for the Telegraph titled “a better plan for Brexit”, Mr Johnson wrote there had been a “collective failure of government, and a collapse of will by the British establishment, to deliver on the mandate of the people”. He said the Chequers proposals – which would keep the UK closely aligned with the EU in trade in goods – represented “the intellectual error of believing we can be half-in, half-out” of the EU. UK firms would be exposed to EU regulations that could disadvantage them, and free trade deals would be made more difficult. This, he said, was a “democratic disaster” and would “cheat the electorate” if implemented. He proposed a looser free trade agreement, “at least as deep as the one the EU has recently concluded with Canada”. Canada’s deal with the EU, signed in 2016, removes the vast majority of customs duties on EU exports to Canada and Canadian exports to the EU. Mr Johnson argued that it should be “relatively straightforward” to negotiate membership of the EU’s aviation area while there should be a process for recognising each other’s rules and regulatory standards and a dispute mechanism system in which neither side’s institutions had power over the other. Any kind of free trade deal based on the Canada model – super or otherwise – would make the UK more distant economically from the EU. It would be a cleaner break, but it would also create more friction in trade, including border checks where there are currently none. Goods coming from Canada into the EU market can be subject to a variety of checks – to make sure customs declarations are filled in correctly, to check product standards or VAT payments, and to ensure the safety of food and animal imports. New technology can help make things run more smoothly, but it’s the prospect of the UK having to go through the same processes, for the huge volume of trade done with its European neighbours, which makes many businesses nervous. On the issue of Northern Ireland, Mr Johnson said any “extra procedures” could be carried out away from the border with Ireland. But he said the UK would have to “buy some time” to negotiate such a deal, pointing at the possible need to extend any transition period beyond 2020. Conservative Brexiteers welcomed the intervention, saying it was the right way forward for the UK. Virgin boss Sir Richard Branson said he believed Brexit would be a disaster for Britain. “I do personally think that entrepreneurs and business people know what this country needs more than Boris Johnson knows,” he told Sky News. Mrs May set out her proposals on the key issue of future trade with the EU after a Chequers summit in July. It has been fiercely criticised by some Brexiteers, who say her plans for a “common rulebook” on goods would compromise the UK’s sovereignty. Up to 40 Tory Brexiteers have said they will oppose her plan if it comes to a vote in Parliament. And European leaders warned her last week that key parts of her strategy were not viable. Mrs May has dismissed previous suggestions that checks could be carried out away from the border between Northern Ireland and Ireland, insisting that any system of checks was “still a hard border”. “You don’t solve the issue of no hard border by having a hard border 20km inside Ireland,” she told the BBC last week.